Good news! My lost luggage was returned to me, two days late but otherwise unharmed. I’m a happy camper now that I have my long johns, ScotteVest fleece and jacket, hat gloves and other necessities for photographing in Iceland. After two days roaming around the Kaflavik airport area and shooting handheld because my tripod was in my misplaced luggage, we took off today for the Snaefellsnes peninsula, which is northwest of the capital city of Reykjavik (pronounced Rake-a-vik). It is a gorgeous area, dotted with immense lava fields from the many eruptions that shaped the Iceland of today (and continue to shape it). The peninsula is dominated by the impressive Snaefellsjokull glacier in the center of a huge national park. The peninsula juts out into the frigid north Atlantic ocean. Here, in May, the temperatures are cold and the wind a steady presence as the landscape soaks in the precious sun that now shines for 20 hours. I captured the scene of the glacier you see above at approximately 10:30 last night. It requires several layers of clothing to be able to stay out for hours photographing the landscape, especially near the water. But the rewards are many. Here is a jpeg version of a 3-photo panorama I took of an interesting phenomenon that I’ve not seen anywhere else in my travels. 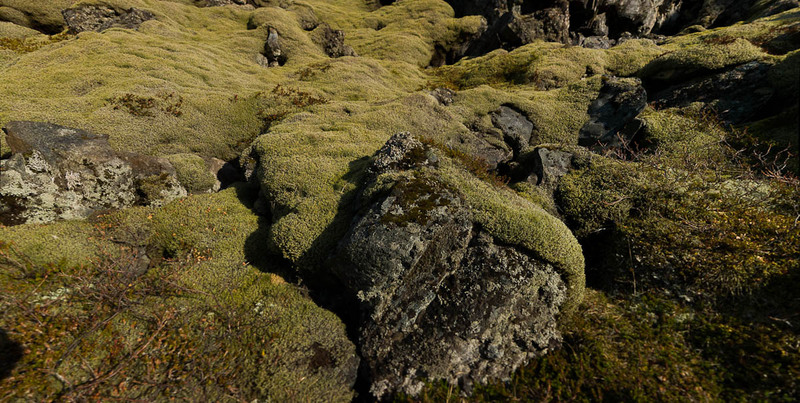 In many places along the southern coast and the Snaefellsnes peninsula (and perhaps elsewhere but I’ve not been there yet), the lava has been colonized by a deep carpet of moss. The moss is luxurious. Wherever I pressed down with my hand it would depress a good four to six inches. These blankets of moss go on for miles.